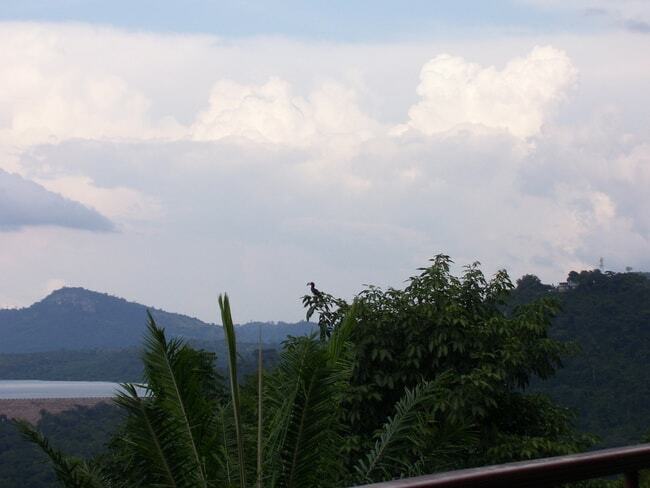 Located in Ghana‘s Eastern region, not too far from the Volta region, is the small town of Akosombo. Still deeply rooted in nature, this peaceful enclave is only two hours from Accra and definitely worth checking out. Here are the top reasons to visit this area. Sip on delicious drinks as you take in spectacular views from the popular elevated terrace which stretches far and wide over the peaceful lake and the iconic Adomi bridge that dates back to 1957. Once at the hydroelectric dam, take a tour of the mighty installation while you enjoy the spectacular views this place offers. It is best to visit during the rainy season when the water levels are high. Remember, it can get scorching hot, so take a hat or umbrella for cover. For tours, contact Volta River Authority on +233-302-6649-41-9 /+233-302-2744-400. The only cruise ship in the entire country traverses Lake Volta and, despite the name, predates the famously doomed relationship between Princess Diana and Dodi Fayed. Built at the Tema Shipyard in 1977 and originally intended to haul cargo, it was converted into a passenger ship in 1991. It has three decks, with the lower one air conditioned, a cocktail bar, an area for barbecuing and even a sick bay. On a good day out, expect photo-worthy views, barbecue lunches and live music on deck. Just 5 km from the shores of Lake Volta is the popular stop, Dodi Island. For more information, call +233 2896 71313 or email info@dodiprincess.com. 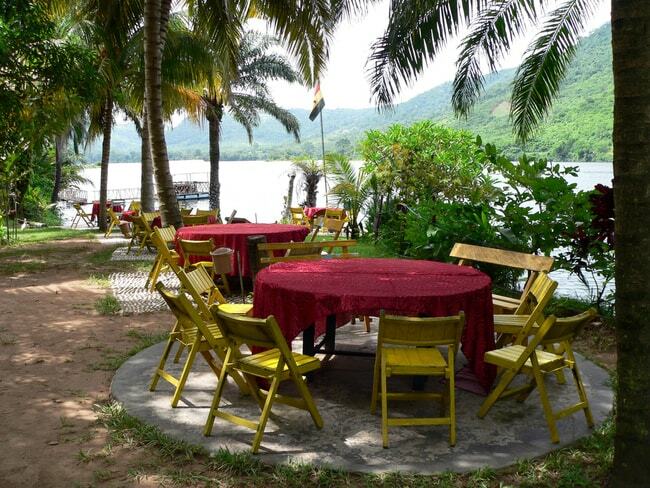 Offering two distinct restaurants and the gorgeously eclectic Palm Lounge Bar, the Royal Senchi is the place to experience the luxurious side of Akosombo. 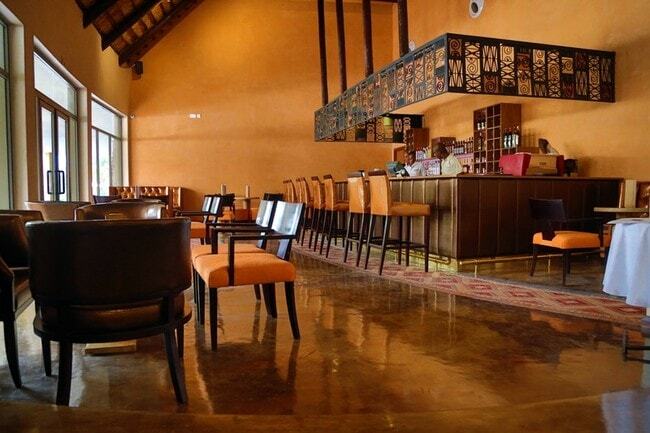 Located on a bend in the river, it includes a spa, opulent weekend buffets, and so much more. Explore the lake on a pedalo or have a picnic at the environmentally friendly park right next door. The Volta River teems with succulent fish, most notably tilapia. At Aylos bay – and at many smaller, older places on the riverfront – there are jetty platforms available. Here, you can throw in a line and see what you catch, or simply enjoy lunch. As with most tropical rivers, the mosquitoes will emerge after 4 pm, so plan your day of lazing on the platform around this fact. The forest surrounding the lake is gorgeous and teeming with wildlife. The Akwamu Gorge is known as an unparalleled bird-watching spot where, if you are lucky, you can spot the almost extinct Picathartes bird. You will be rewarded for the uphill climb with incredible views looking down on the snaking river. Contact the Akwamu Gorge Conservation Trust on +233 24 432 9659. Just over the Adomi bridge is the unspoiled beauty of Peki Valley. It is the place where the Ewe of Dahomey (modern day Benin) migrated to. Once an important town in the slave trade as it linked the interior with the coastal towns, the area also has caves that sheltered slaves who managed to escape their captors. There’s so much to do– bike or walk from here to Lake Volta, bunker down at the delightful Roots Yard lodge, hike the surrounding mountains for great views, take a guided walking tour through a butterfly-filled forest, or visit the perfectly preserved house of Ephraim Amu, a noted Ghanaian musician and composer. Contact the Rootsyard Lodge on+233 54 974 7047. There’s nothing quite like trawling a large, wide lake in a traditional canoe – the feel of slicing through the water on such a delicate vessel, being one with the lake as the banana-shaped boat dips and sags, trailing your hands through the green water, observing fish and other life underneath all make for a wonderful experience. This is a relaxed way to see Lake Volta from the ground level and it’s also possible to stop at the numerous overgrown islands along the way. Bargaining with the many canoe owners is part of the fun. Past the bridge and lining the road on the Asikuma junction are the traditional drum makers. 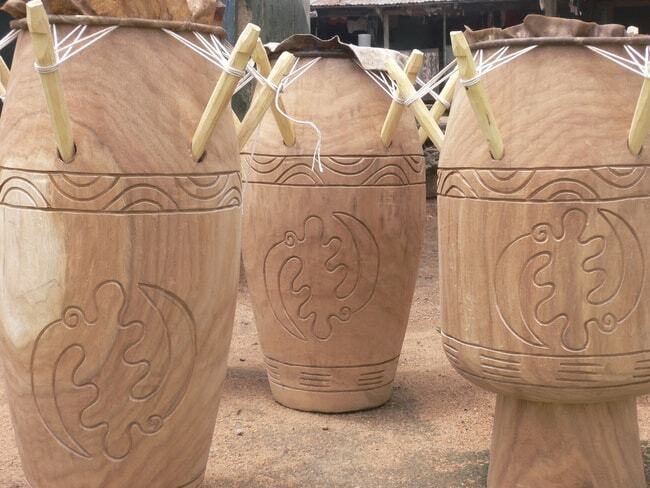 You can take a drum workshop and learn how to make or play these instruments. The town also produces their own particular type of kente, appropriately called Ewe Kente. There is much fun to be had at this popular spot that features a man-made beach. It is a haven for those who love activities and boasts kayaks, beach volleyball, rowboats, soccer, basketball, two splash pools and a water slide. Feast on scrumptious local dishes, freshly caught fish and popular favourites such as chicken kebabs, burgers and pork chops.